I hope everyone had a nice Labour Day. I took my family, some friends, my godson and my white bucks to a baseball game. The home team won, a nice ending to a very busy weekend of brunches, dinners and pool parties that began Friday night. This is the soup I served Friday evening. It must be the easiest first course ever and soup can be quite elegant when served in a china tea-cup or demi-tasse. Especially when it is an appealing shade of green. It also gives you something else to do with your mint that you grow for Juleps. 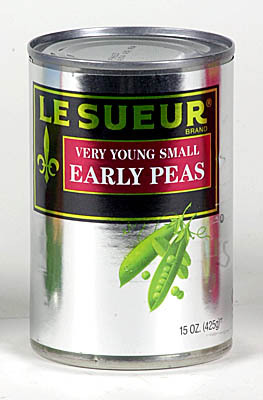 1 small can of Le Sueur Very Young Small Early Peas or 8 ounces of fresh peas, shelled. Add all ingredients to a blender. Blend into desired consistency. Chill for two hours or so. Garnish with a fresh sprig of mint. This entry was posted in Entertaining and tagged Chilled Minted Pea Soup, Entertaining, recipes, Soup. Bookmark the permalink. Sounds so easy and elegant, but alas, that is your M.O! Sounds good. I’ve made something similar, but with thyme instead of mint. I’m not sure I’ve had mint in soup as far as I know. I’ll have to try it some time. Thanks. This is a variation of a summer soup that I make. I serve it a shallow soup bowl and swirl a little Creame Fraiche on top. Top with mint or half a rasher of apple smoked bacon. My guest actually think that I am good cook. JohnS, the bacon would be a fine touch. And you are a good cook. Indeed elegant and a good way to go green. I remember reading that in the olden days, men used to throw their straw summer hats into the field on the labour day weekend baseball game. How times have changed. This sounds like a lovely soup. I also love chilled summer soups. They are refreshing, tasty, and easy to prepare. I don’t know why more restaurants cannot devise such delicious soups when they are so simple and economical. Sometimes I like to garnish chilled green soups with a dollop of whipped cream or sour cream. You’ll have to go back to the ich Bin Ein Berliner site for my take on the English pea.